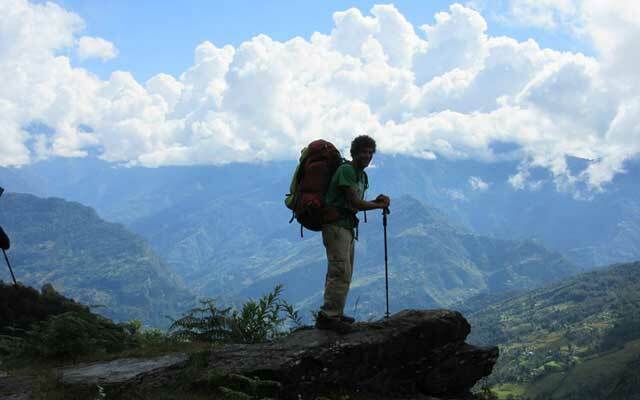 Kanchenjunga trekking is situated in the eastern frontier Taplejung District of Nepal. Kanchenjunga Base Camp trekking know as mount Kanchenjunga 8586m height above sea level third highest mountain peak in the world. It is laid down between Nepal and Darzeeling Sikkim border. Tibetan call Kanchenjunga means ‘the five treasure houses of snow’, which gives you some idea of what to expect should you visit this area. 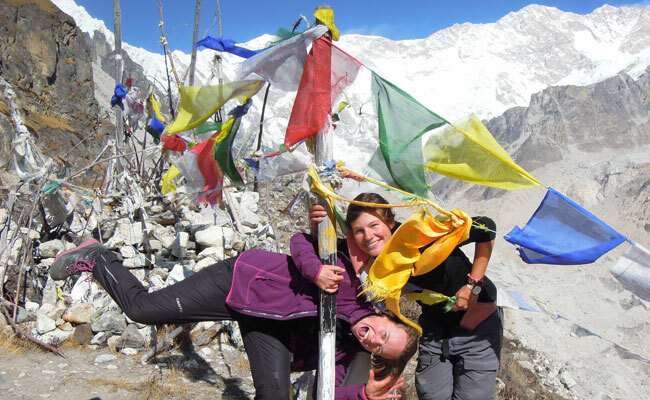 Trekking in Kanchenjunga base camp is attractive because it is less visited by tourist, the rhododendron forests are spectacular and the mountain scenery offers new vistas. A number of glaciers and server high trekking passes originated from Himalaya have no doubt added to the beauties of this region. The Kanchenjunga conservation area that surrounds it extends into protected areas in Sikkim and Tibet, and comprises a beautiful, un-spoilt wilderness. This is a Snow Leopard territory, but the reclusive predator shares the unbounded forests with the Himalayan Black Bear and the Assamese Macaque, among others. 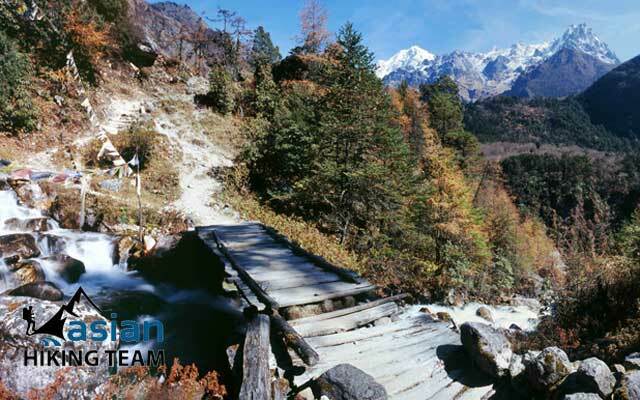 Cascading waterfalls, lush vegetation and thousands of species of plants await those who take the long trail to Kanchenjunga Base Camp, the main route which has been described as ‘untracked’. The northern part of Kanchenjunga, inhabit by Sherpa but the southern lower part is full of ethnic groups such as Rai, Limbu, Magar, Tamang, Braman and Chhartri etc. Mostly evergreen conifers are interspersed with few cold-hardy deciduous species. South-facing slopes are usually treeless or contain pure stands of stunned rhododendrons. North-facing slopes have juniper, fir, willow, birch and rhododendrons. In Ghunsa valley, look out for extensive stands of the spectacular Himalayan larches (Larix griffithiana) that turn the hillsides a golden-yellow in the fall. The Woody vegetation in this zone of moist alpine scrub consists of stunned junipers, roses and rhododendron, gentian and saxifrage abound. Hardy alpine grasses include creeks, juncos and Poe. Look out for herds of blue sheep foraging on hillsides above tree line. Perhaps, you may see signs of snow leopard that preys on these sheep. For those who have less time, there is a direct flight to Taplejung and visit to South side base camp and return the same way to Taplejung (Sukhetar). Otherwise to cross the high pass Sele Le pass visit northern base camp, returning to Yamphudin “the beautiful village” all the way to Taplejung or Khebang-Medibung catch the local Jeep to Ilam continues drive to Kathmandu. There are server way to reach Taplejung either you can flight from Kathmandu to Biratnagar or Bhadrapur and drive Taplejung or you can drive tourist (night or day bus) bus to Birtamod 10-12 hours and take a local bus or Jeep to Taplejung 7-8 hours. 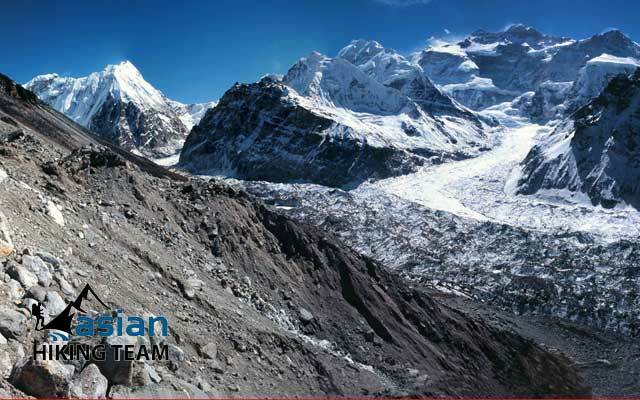 Asian Hiking Team organizes Kanchenjunga Base camp trekking as tourist interest and time frame. 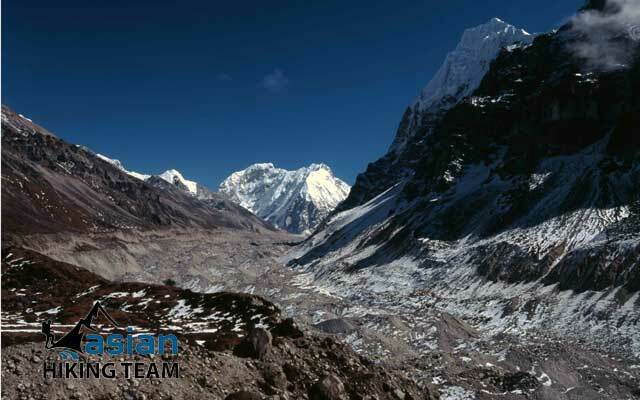 In our itinerary we discretion both base camp, however you can visit one base camp as well. But we highly recommend you to visit both base camps. Asian Hiking Team operates the trekking basical guest house or tea house for small group or individual. If the group size is more than 20 persons we organize a tented camping. In the high pass base camp call Sele Le fade or Ramche, the team have very basic tea house or tented house. Every Guest house serves the traditional Nepali meal Dal Bhat Tarkari (rice, curry and lentil soup). All Guest Houses of our routes have a variety of different food items, such as rice, vegetables, noodles, potatoes and soup. Walking in Kanchenjunga base camp requires special trekking permits, the cost for trekking permit per week per person US$ 10. And need to pay Kanchenjunga Conservation entry permit US$ 22 per person. Day 01: Kathmandu to Biratnagar and Suketar flight, 2300m, , overnight at hotel (L/D). Day 02: Suketar to Mitlung 912 m, 6 hours, overnight at tea house/guest house (B/L/D). Day 03: Mitlung to Chirwa 1270 m, 5.30 hours, overnight at tea house/guest house (B/L/D). Day 04: Chirwa to Sekathum 1660 m, 6 hours, overnight at tea house/guest house (B/L/D). Day 05: Sekathum to Cyapla 2730 m, 5 hours, overnight at tea house/guest house (B/L/D). Day 06: Cyapla to Ghunsa 3595 m, 4 hours, overnight at tea house/guest house (B/L/D). Day 07: Rest day in Ghunsa, overnight at tea house/guest house (B/L/D). Day 08: Ghunsa to Khambachen 4095 m, 5 hours, overnight at tea house/guest house (B/L/D). Day 09: Khambachen to Lhonak 4785 m, 4.30 hours, overnight at tea house/guest house (B/L/D). Day 10: Lhonak to Pangpema (Kanchenjunga Base camp) 5100 m 4 hours, overnight at tea house/guest house (B/L/D). Day 11: Pangpema to Khambachen, 3 hours, overnight at tea house/guest house (B/L/D). Day 12: Khambachen to Ghunsa, 4 hours, overnight at tea house/guest house (B/L/D). Day 13: Ghunsa to Sele La pass base camp 4290 m, 5 hours, overnight at tea house/guest house (B/L/D). Day 14: Sele la pass base camp to Tseram 3870 m, 6-10 hours, overnight at tea house/guest house (B/L/D). Day 15: Tseram to Ramze 4580 m, 4 hours, overnight at tea house/guest house (B/L/D). Day 16: Ramche to Oktang 4730 m, (Kanchenjunga Base camp) and same day return back to Ramze 6 hours, overnight at tea house/guest house, overnight at tea house/guest house (B/L/D). Day 17: Ramche to Tortong 2995 m, 6 hours, overnight at tea house/guest house (B/L/D). Day 18: Torong to Yamphudin 2080 m, 6.30 hours, overnight at tea house/guest house (B/L/D). Day 19: Yamphudin to Tellok 1500 m, 5/6 hours, overnight at tea house/guest house (B/L/D). Day 20: Tellok to Lalikharka 2265m m, 5/7 hours, overnight at tea house/guest house (B/L/D). Day 21: Lalikharka to Suketar 2420 m, 3 hours, overnight at tea house/guest house (B/L/D). Day 22: Flight Suketar to Biratnagar and same day to Kathmandu, overnight at hotel (B/L). Day 01: Kathmandu flight to Biratnagar and same day flight to (Taplejung) Suketar 2300m, overnight in Suketar (L/D). Day 02: Suketar to Mitlung 912 m 6 hours (B/L/D). Day 03: Mitlung to Chirwa 1270 m 5.30 hours (B/L/D). Day 04: Chirwa to Sekathum 1660 m 6 hours (B/L/D). Day 05: Sekathum to Kyapla 2730 m 5 hours (B/L/D). Day 06: Kyapla to Ghunsa 3595 m 4 hours (B/L/D). Day 07: Rest day in Ghunsa (B/L/D). Day 08: Ghunsa to Khambachen 4095 m, 4.30 hours (B/L/D). Day 09: Khambachen to Lhonak 4785 m, 4.30 hours (B/L/D). Day 10: Lhonak to Pangpema (Kanchenjunga Base camp) 5140m, 4 hours (B/L/D). Day 11: Pangpema to Khambachen 3 hours (B/L/D). Day 12: Khambachen to Ghunsa 4 hours (B/L/D). Day 13: Ghunsa to Sele La pass base camp 4290m, 5 hours (B/L/D). Day 14: Sele la pass base camp to Tseram 3870 m, 7 hours (B/L/D). Day 15: Tseram to Ramche 4580 m 4 hours (B/L/D). Day 16: Rest day in Ramche (B/L/D). Day 17: Ramche to Torontan, 2995m, 5/6 hours, overnight tea house/lodge (B/L/D). Day 18: Torontan to Yambudin, 5/6 hours, 2080m, overnight tea house/lodge (B/L/D). Day 19: Yambudin to Khebang 1910m, 4-5 hours, overnight lodge (B/L/D). Day 20: Khebang to Medibung 1510m, 5/7 hours, overnight lodge (B/L/D). Day 21: Early morning drive to Ilam 2150m, 3/4 hours by local bus/Jeep, Overnight in Guest house (B/L/D). Day 22: full day in Ilam, visit Tea garden, overnight in Illam, Guest house (B/L/D). Day 23: Early morning take private Jeep to Kathmandu 15-16 hours, arrive late in Kathmandu 9/11 pm (B/L). Note: There are not daily flight to /from Sukhetar (Taplejung) airport so that we need to flight from Kathamdu to Bhadrapur and drive to Taplejung 8/9 hours so that Day 01 we take flight to Bhadrapur and drive to Taplejung and Day 22 early morning drive by private Jeep to Bhadrapur, overnight stay in Bhadrapur and next morning flight to Kathmandu. Special permit for 3 weeks US$ 10 per week per person. Kanchenjunga Conservation entry permits; Fees. Day 01: Kathmandu flight to Biratnagar and same day flight to (Taplejung) Suketar 2300m, overnight in Suketar at hotel. Early morning half an hour drive to domestic airport in Kathmandu than take flight to Biratnagar 40 minutes (transit in Biratnager, waiting time is depend on weather) continues flight to Surketar (Taplejung) 25 minutes, after your arrival, transfer to Hotel, and explore the small town (prepare for trekking), overnight hotel. Day 02: Suketar to Mitlung 912 m 6 hours, overnight at tea house/guest house. We officially kick start the day with a downhill walk to Mitlung. The trails throughout the lower sections of the Kanchenjunga region pass through fertile valleys with beautiful pastures and small villages. We then cross Hangdewa River and walk alongside the raging Tamor River. As we gradually head in a northerly direction the trail steepens after a few hours before a final descent of 350 meters on a muddy trail to Mitlung. Day 03: Mitlung to Chirwa 1270 m 5.30 hours, overnight at tea house/guest house. The trail ascends and descends steadily as we make our way towards the village of Sinwa. We continue trekking downhill until we reach Tawa. At Tawa, we ascend to some heights and cross the suspension bridge at Thiwa. We pass beautiful rural landscape along the way and reach Chirwa, a beautiful Limbu village with few lodges, tea shops etc. Overnight in Chirwa. Day 04: Chirwa to Sekathum 1660 m 6 hours, overnight at tea house/guest house. The trek from Chirwa to Sukathum passes through varied landscapes such as cardamom fields and dense forests. We trek uphill for sometime then descend to the lush green fields below and continue trekking along the Tamor River passing through a dense forest. It’s both uphill and downhill trek until crossing the Ghunsa River after which we reach Sukathum, spent a night. Day 05: Sekathum to Kyapla 2730 m 5 hours, overnight at tea house/guest house. After breakfast we start our trek to passing Amjiosa 2560m our all the way is climb, no flat, we have lunch in Amijiosa can see the Tibetan biggest village and continues trek to Kyapla 2730m. Overnight in Kyapla. Day 06: Kyapla to Ghunsa 3595 m 4 hours, overnight at tea house/guest house. Trek start after breakfast, today our itinerary is short day so may we have lunch in Ghuna however we passing Phere village 3120m, there is some tea houses. We cross the Tamor River than reach in Ghunsa. After reach we will bring you in monastery and small hydroelectricity and shopping etc, Overnight in Ghunsa. Day 07: Rest day in Ghunsa, overnight at tea house/guest house. Day 08: Ghunsa to Khambachen 4095 m, 4.30 hours, overnight at tea house/guest house. Following the river valley, crossing the landslide and river, some time into the jungle than continues ascent to reach Khambachen 4095 meter 4.30 hours. Today we have lunch in same place because there is not proper place on the way for lunch. Overnight in Khambachen. Day 09: Khambachen to Lhonak 4785 m, 4.30 hours, overnight at tea house/guest house. Today is the trekking path is gradually up than reach the flat, we can see the glacier view and many mountain view include Kanchenjunga top. There is not proper place for lunch so we provide Lunch in Lhonak today. After flat area than again cross the river to reach in Lhonak 4785m 4.30 hours. Overnight in Lhonak. Day 10: Lhonak to Pangpema (Kanchenjunga Base camp) 5140m, 4 hours, overnight at tea house/guest house. It is well worth exploring the upper end of the valley to fully appreciate the peaks that make up one of the largest mountain masses in the world. The main peak of Kanchenjunga and Wedge Peak cannot be seen until we are almost at Pangpema (5140m) and to increase our chances of good mountain views, we aim to spend an overnight here. This will, however, depend on the weather and trail conditions and progress of each particular group member, which will be decided by your guide. The trail follows moraine for much of the time and due to its ever changing nature and infrequent use is often in poor condition. 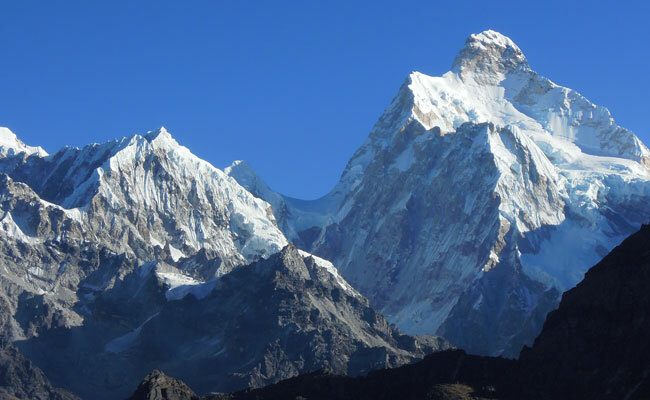 There are a number of alternative side trips in the area that provide impressive mountain panoramas including Tent and Pyramid Peaks and the Twins. One does not need to go far to enjoy the impressive yet varied mountain views. We aim to spend as much time as possible in the area hoping the weather will be in our favor. Overnight in Lhonak. Day 11: Pangpema to Khambachen 3 hours, overnight at tea house/guest house. All the way trek down so not far way but we can reach within 3 hours to khambachen, overnight at tea house. Day 12: Khambachen to Ghunsa 4 hours, overnight at tea house/guest house. We follow same way back to Ghunsa, its takes 4 hours. Overnight at Tea house. Day 13: Ghunsa to Sele La pass base camp 4290m, 5 hours, overnight at tea house/guest house. 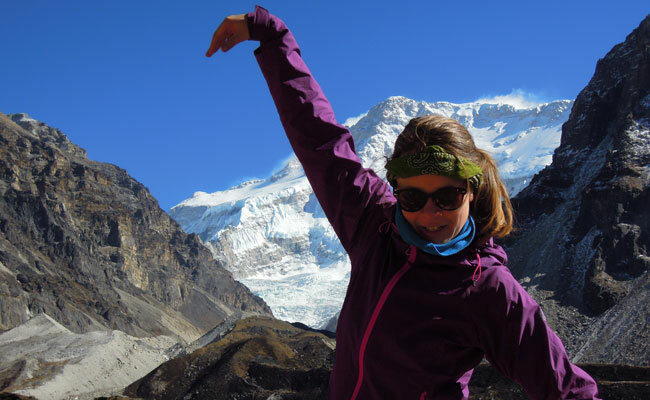 Day 14: Sele la pass base camp to Tseram 3870 m, 7 hours, overnight at tea house/guest house. We do an uphill trek and enjoy the mesmerizing south side view of Jannu Himal and Makalu (the world's 6th highest mountain). Today is a strenuous trekking day as we cross several passes- Sinion La, Mirgin La and Sinelapche Bhanjyang. We then make a steep descend to Tseram or Cheram and spend the night there. Day 15: Tseram to Ramche 4580 m 4 hours, overnight at tea house/guest house. 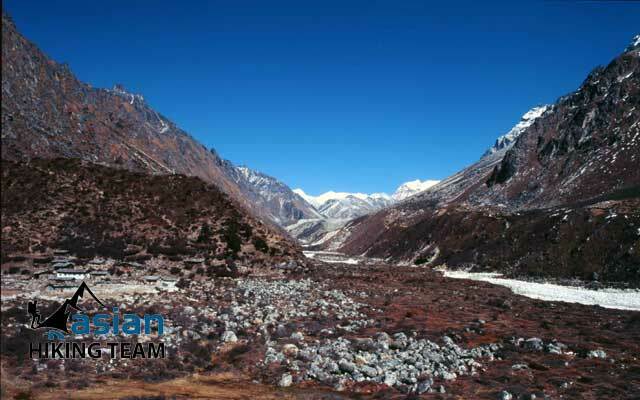 Early morning trek to Oktang Base camp, also call Kanchanjunga base camp. The view also very nice from Oktang and return same way back to Ramze. Overnight in tea house. Day 17: Ramche to Torontan, 2995m, 5/6 hours, overnight tea house/lodge. While descending from Tortong to Yamphudin we pass through Lasiya Bhanjyang which involves walking up through trees and area of landslides. The terrain changes after every monsoon but by the middle of October it should be stable with a route through. Walking further down we reach the village of Yamphudin, a village inhabited by Sherpas, Limbus and Rais, overnight in Yambudin. Day 19: Yamphudin to Tellok 1500m 5/6 hours, overnight at tea house/guest house. After breakfast we start trek to Tellok 1500m. the trekking today is up and down but its easy walking to reach Tellok. Overnight Tea house. Day 20: Tellok to Lalikharka, 2465m, 5/6 hours, overnight at tea house/guest house. Trek to Lalikharka, where we cross the terrace, jungle, and small village to reach in Lalikharka, we have lunch on the way, Overnight on Tea house. Day 21: Lalikharka to Suketar 2420 m 3 hours, overnight at tea house/guest house. Today is the last day of trekking and its short day to follow the jungle and climb up to reach Deurali, we have lunch in Suketar, our guide reconfirm air tickets, Overnight in Hotel. Day 22: Flight Suketar to Biratnagar and same day to Kathmandu, overnight at hotel. Early morning flight to Biratnagar and same day fly to Kathmandu. Optional possible to take bus to Kathmandu, 15/16 hours. Overnight in Kathmandu. Day 01: Kathmandu flight to Biratnagar and same day flight to (Taplejung) Suketar 2300m, overnight in Suketar. Day 02: Suketar to Mitlung 912 m 6 hours. Day 03: Mitlung to Chirwa 1270 m 5.30 hours. Day 04: Chirwa to Sekathum 1660 m 6 hours. Day 05: Sekathum to Kyapla 2730 m 5 hours. Day 06: Kyapla to Ghunsa 3595 m 4 hours. Day 07: Rest day in Ghunsa. Day 08: Ghunsa to Khambachen 4095 m, 4.30 hours. Day 09: Khambachen to Lhonak 4785 m, 4.30 hours. Day 10: Lhonak to Pangpema (Kanchenjunga Base camp) 5140m, 4 hours. Day 11: Pangpema to Khambachen 3 hours. Day 12: Khambachen to Ghunsa 4 hours. Day 13: Ghunsa to Sele La pass base camp 4290m, 5 hours. Day 14: Sele la pass base camp to Tseram 3870 m, 7 hours. Day 15: Tseram to Ramche 4580 m 4 hours. Day 16: Rest day in Ramche. Day 19: Yambudin to Khebang 1910m, 4-5 hours, overnight lodge. We descend from Yamphudin, cross the bridge at Samekham and continue following the Kabeli Khola. We pass through Mamankhe which houses the Limbu Museum and Cultural Center. We then cross the bridge over Khaksewa Khola and ascend through the cardamom forest, pass by a few villages and descend further down to Khebang. Overnight at Yangpang. Day 20: Khebang to Medibung 1510m, 5/7 hours, overnight lodge. Instead of going back to Taplejung we descend down to Medibung. By opting for Medibung we will not only be saving us time but will also get to enjoy the landscape of a different route. While descending to Medibung we pass through some really beautiful terraced villages, where the people are very interested to see you. We spend the night in Medibung and enjoy the hospitality of the villagers. Day 21: Early morning drive to Ilam 2150m, 3/4 hours by local bus/Jeep, Overnight in Guest house. Today we take local bus or Jeep to Ilam Bazaar; we follow the time as local bus time so your guide mentions you before start. As well as if the seasonable road reaches further Medibung wherever possible to catch bus. It takes 3 to 4 hours drives, overnight at hotel in Illam. (note: porter come directly to Kathmandu). Day 22: full day in Ilam, visit Tea garden, overnight in Illam, Guest house. Visit to Kanyam and Fikkal tour, these places have large tea land and these tea plantation areas are famous among tourists for picnicking, sightseeing and taking photographs. or visit to Mai Pokharai which is pilgrimage palace or Antu Danda for a best view of Mt. 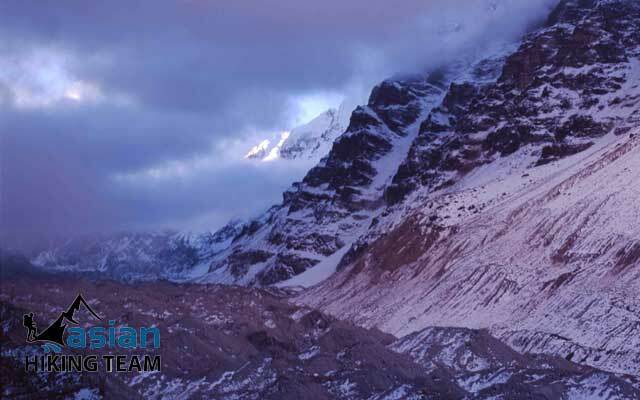 Everest and Kanchenjunga, you can talk with guide on day 23 and start a day trip, overnight in Ilam. Day 23: Early morning take private Jeep to Kathmandu 15-16 hours, arrive late in Kathmandu 9/11 pm. Meet Jeep diver on day 24 in Ilam and get prepare when to start, it is better to start very early morning. Normally, many bus or Jeep starts on night because of arrive in Kathmandu on next day, take more than 15 hours. If you start at 4 /5 am, than you will be here at 9/11 pm, Arrive in Kathmandu, transfer to hotel, overnight in Kathmandu. Note: Now a day Sukhetar (Taplejung) airport on Construction so that we need to flight from Kathamdu to Bhadrapur and drive to Taplejung 8/9 hours so that Day 01 we take flight to Bhadrapur and drive to Taplejung and Day 22 early morning drive by private Jeep to Bhadrapur and flight to Kathmandu or overnight stay in Bhadrapur and next morning flight to Kathmandu. 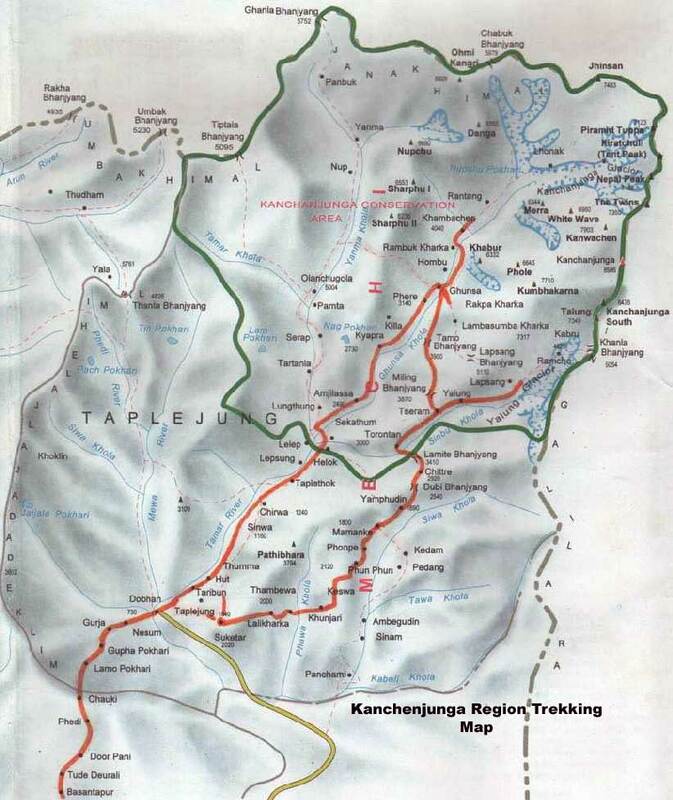 Kanchenjunga Permit cost Per person per week US$ 10 and Conservation fees NRS. 2250 per person.